During our trip home from London and Abu Dhabi, we were able to use the pre-clearance facility to clear immigration and customs in Abu Dhabi. If you're ever traveled to Canada, you've experienced a pre-clearance facility. Essentially you are cleared to enter the United States prior to departure via a US Customs and Border Patrol facility that is managed and staffed by US officers. Once through the checkpoint, you're in an isolated area prior to departure. When you land back in the US, you head straight to baggage claim or the curb. Beyond Canada, there are pre-clearance facilities in the Caribbean, Ireland, and in Abu Dhabi. 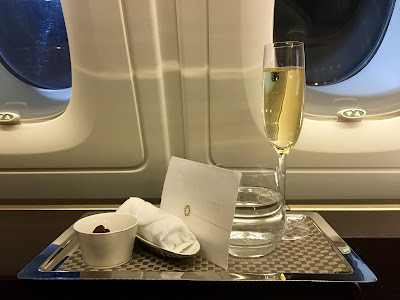 We've traveled to Vancouver and Toronto recently but I was interested to see how the experience differed on another continent. 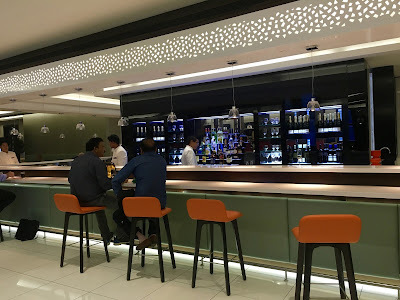 After a couple of hours in the Etihad Premium Lounge, we headed back into the terminal towards the pre-clearance facility which was well marked with signage. At this hour (2AM) the facility was pretty empty despite three (JFK, Chicago, San Francisco) US bound flights. We passed through another security checkpoint before entering the pre-clearance facility. The hall looked like any other US immigration checkpoint complete with USCBP officers and pictures of The President and Secretary of Homeland Security on the walls. The facility contained a half dozen or so Global Entry kiosks. We soon had our printouts and were headed to speak to a USCBP officer before leaving the UAE. Kind of a surreal feeling. We were through after 30 seconds or so of conversation - essentially "back in the US" with 45 minutes to go before boarding. Etihad has built a lounge specifically for these US bound flights which although small, was perfectly serviceable for 45 minutes. The lounge contains a small amount of seating, a bar, food offerings, and restrooms. 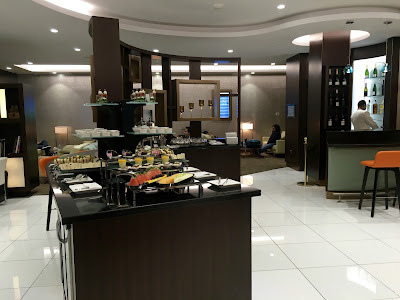 We had a coffee and a few snacks before heading out to board the waiting A380 bound for JFK! I had heard horror stories about long lines and mismanagement of the pre-clearance facility. That doesn't seem to be the case any longer. Everything was clean and efficient - in many ways a more pleasant experience than going through this process in the US. 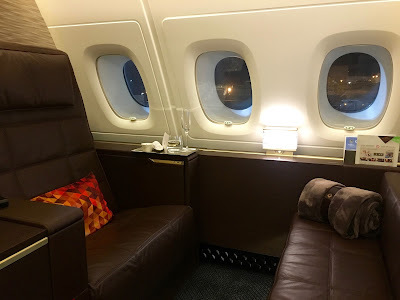 When we landing at JFK, we were in baggage claim in 10 minutes claiming our bags before our Etihad Chauffeur whisked us off to The New York EDITION! One of the must have travel tools these days is TSA Precheck (stylized with a check mark for some unknown branding reason). I've saved countless hours breezing through security while my shoes stay on, and my liquid bag/laptop stay in my backpack. It's amazing. For international travelers, Global Entry is a life saver. No waiting in immigration lines to talk to an officer - you hit the kiosk, answer some questions and snap a selfie. You're through in a handful of minutes. This has enabled us to make tight international to domestic connections. A huge benefit when you're tired and just want to get home. Both Emily and I have TSA Pre with our Global Entry. You can get TSA Pre on it's own but if you're going to take even one international trip (it's good for 5 years) in the next 5 years, you should apply for Global Entry. The fee is $100 and I think worth it. You can do better than that though. There are a couple of credit cards that provide a $100 credit towards the fee every 5 years. Both Emily and I are in the middle of our 5 year "term." My parents are headed to Europe this summer for their anniversary and they have a tight connection coming home. I suggested that they get Global Entry for their upcoming trip which will also give them TSA Precheck for their domestic travel. We both used our fee waivers from previous cards so had a couple left. My parents applied and they put one application on my Amex Platinum and the other on my Citi Prestige. The fee credit is applicant "agnostic" so you can "sponsor" a friend or family member if you already have Global Entry or TSA Pre. My Amex Platinum credit has already posted. While this benefit is often trumpeted as a $100 credit, in reality you can only get it once every 5 years. So if you're keeping the card and paying the annual fee, it's more like $20 a year. That said, I was happy to save my parents $200 and I know that there travel experience will be much improved once they are fully enrolled for Global Entry! You will have a better shot of getting TSA Pre-Check during your travels leaving from the US. Typically (at DEN) this saves 15 minutes per departure. You can even use Global Entry to save time upon arriving in Australia! 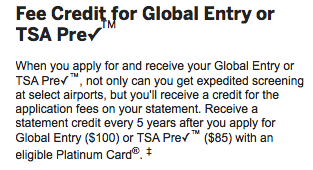 Global Entry costs $100 for 5 years. If you have to pay for it, I think it's well worth it even for one trip per year. That's $20 a year to save 30 - 60 minutes plus all the time you'll save with TSA Pre-Check. And you'll be way better off if you have a tight connection. But there are a couple of ways to get it for free. Platinum and 1K United elites get it for free. American Express (this was our method) will reimburse your $100 fee if you are a Platinum cardholder. In terms of getting approved, you first fill out an application online which takes 15-20 minutes. Next, you will have to schedule an in-person interview at an airport. There are a couple of non-airport locations (Houston and DC) but generally you have to go (or do this during a layover) to an airport. We did our interview at DEN and it took about 15 minutes. They take your picture and fingerprints and you're all set. In a few weeks, you'll receive your official card (complete with RFID protection sleeve) for entry back into the US from Canada and Mexico (although I always carry mine in my travel wallet regardless of where I'm going). During our return trip from London earlier in the year, our original flight was cancelled and we were rebooked on a later one. The connection ended up being super tight and Global Entry saved the day. We made it from an international arrival to a domestic departure with checked bags in 30 minutes. A process that would normally take at least an hour. So if you are in the midst of planning a few international trips over the next few years, I would definitely recommend signing up for Global Entry. It is awesome!